Made for the all mountain hard charger, the CAPiTA Mercury Snowboard sports a stiff and precise feel that can power over, under or through anything. This directional board offers incredible float from the tip and tail rocker that combines with a New Age directional sidecut for stellar grip on rougher terrain. 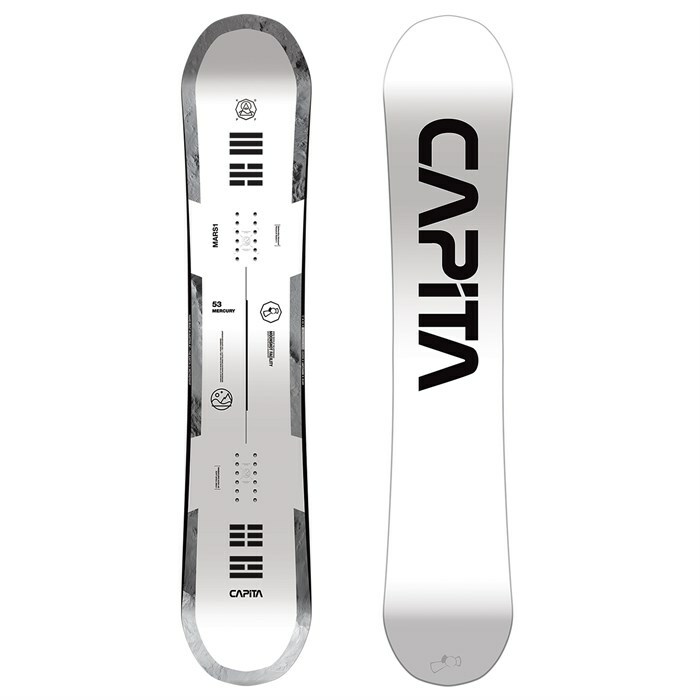 Finished with Bamboo struts and v-shaped carbon/flax reinforcements for a super lightweight, poppy and powerful ride, there's no wonder many riders consider the CAPiTA Mercury Snowboard the most versatile, high performance deck in the CAPiTA line up. Take a trip to space and back with this rocket of a board. All-Terrain V1 Profile  This revolutionary all-terrain shape provides the best of both worlds. It has raised camber through the inserts to retain high-speed edge hold through variable terrain, and elevated contact points to land and float in powder. New Age Directional Sidecut with Death Grip™  A progressive sidecut, which also incorporates a reverse sidecut arc in the midsection of the board. Due to a reduced effective edge as a result of hybrid camber shapes, this reverse camber arc provides a point of contact to retain control throughout the turn and is affectionately referred as Death Grip™. FSC® Certified Panda Core™  The PANDA CORE™ was built for a high performance return of energy in a lightweight and versatile core. From razor sharp turns on demand, to huge ollies, this core was engineered with all-terrain technical freestyle riding in mind. Comprised of the P2 Superlight™ Core and enhanced with inlaid Bamboo Power Rods, this high-density core is strong enough to meet the needs of the all-terrain customer while saving considerable weight. Amplitex™ V-Tech Amplifier  Grid woven tech tape featuring the response of carbon with the dampness of flax. Holysheet™ Fiberglass with Magic Bean Resin  Triax/ Biax Holysheet™ has higher glass to weight ratio than normal fiberglass for a more powerful and dynamic ride when impregnated with the new high performance plant based Magic Bean™ Resin. UltraDrive™ Base  Twice the molecular weight of SuperDrive™, this sintered ultra-high molecular weight, ultra-high density polyethylene is the Millenium Falcon of base materials. The force is strong with this one. Multitech™ Level 6 DeepSpace™ Silkscreen + PAM16000™ Topsheet with Metallic Underlay  Strategically layering ink on multiple levels from the top and the bottom, CAPiTA imbues their graphics with a sense of life through depth. PLT Topsheet Technology™  PLT™ technology is exclusive to CAPiTA MFG and magically bonds the topsheet to an already pressed snowboard. This is magical because the rest of the world mashes their topsheet on with glue, heat and pressure during the pressing stage. Doing so causes the fiberglass structure underneath to show through the topsheet. And because nobody wants to spend their hard earned cash on a bumpy snowboard, many companies slather their tops with a thick, toxic lacquer to smooth things out. Not only is that ish heavy and can potentially develop unsightly hairline cracks, it's also really unhealthy for the working environment. The PLT™ machine produces a featherlight, smooth, high-gloss finish, without all that poisonous deadweight. Made at the Mothership (100% Hydro Powered Facility)  The NH3 natural gas heating system has an ODP (Ozone Depletion Potential) and GWP (Global Warming Potential) of 0, with a COP (coefficient of performance) of 5. This means that for every 1 unit of energy consumed by the system, 5 units of energy for heating and cooling is achieved. It's like making the effort to spin a 360, but landing a silky smooth 1800 instead. The Mothership is also designed to maximize the use of natural light during the day by having ample skylights and strategically placed interior cutaways throughout the entire facility -- while energy efficient LED lighting acts as supplementary illumination where necessary. Freestyle Freestyle or park snowboards tend to be a bit shorter in length and love terrain parks, rails, jibs, trash cans, tree trunks, riding switch (non-dominant foot forward), wall rides and more. Freestyle boards often feature a true twin shape, and are typically selected by those looking to ride the terrain park. A more versatile variant of a freestyle board is the all-mountain freestyle, which combines the versatility of an all mountain snowboard with the playfulness of a freestyle snowboard. All-Mountain All-mountain snowboards are designed for exploring the whole mountain. They are your go-to for a snowboard that will do anything. They feel at home on groomers, powder, park runs and almost anything in between. The vast majority of snowboarders choose all-mountain boards for their great versatility. If you’re just getting started or unsure of exactly what you need, an all-mountain snowboard is a great choice. Freeride Freeride snowboards are designed for the rider that spends most of the day off groomed runs and in backcountry terrain. They typically have a stiffer flex and are ridden in longer sizes than freestyle snowboards. Freeride snowboards often feature a directional shape that is designed to perform optimally in one direction. Rocker/Camber/Rocker Rocker/Camber/Rocker shapes seek to give you both hard-carving edgehold on firm snow from camber underfoot with enhanced turnability and float in powder from the rockered tip and tail. This profile is increasingly popular for freeride boards designed primarily for soft snow.